The figure is based on information from more than 120 crude oil assays from BP, ExxonMobile and Statoil (2008 - 2017). The crudes are produced all over the world. Each datapoint reperesents one specific oil. Each oil contains both nickel and vanadium. See also Crude oil viscosity as function of gravity. Engineering ToolBox, (2017). Crude oil metal (Ni, V) content as function of gravity. 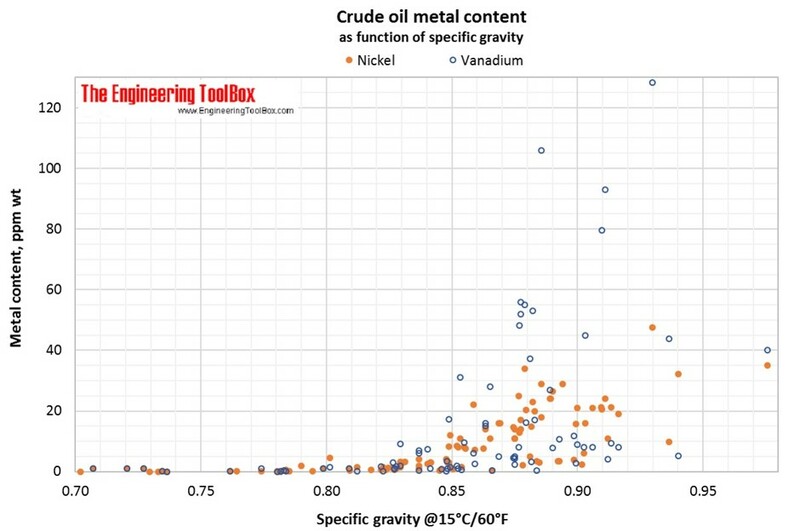 [online] Available at: https://www.engineeringtoolbox.com/nickel-vanadium-Ni-V-crude-oil-petroleum-gravity-density-d_1960.html [Accessed Day Mo. Year].